If you’re currently looking for or researching around bifolding doors, there’s a huge amount of information available. There are a great many bifolding door brands available and some are even names that are rebranding of existing products. As your local bifolding door experts, we’ve put together some frequently asked questions about bifolding doors and the process. We hope this answers the most common questions about bifolding doors, but please contact us if you’d like to know more. A bifolding door is also known as a folding door, a sliding folding door, concertina doors and bifold doors. They are a series of individual door panels connected by hinges and the gearing mechanism to enable them to open, hinge and fold back. There are two types of gearing available, the type that is at the top of the door and the bottom hung arrangement where the gearing at the bottom takes the weight of the doors. Why do you sell more than one make of bifolding door? Many companies that offer bifolding doors choose to only offer one brand or ‘system’ as it’s more commonly known. At Basfords we know that every customer is different and their needs are also different. So whilst all our doors will give you peace of mind in being tested and approved for high security and exceptional weather performance, they differ in other ways. Our Origin doors are the only ones with a 20 year guarantee. This for many people is very important. Their colour coded gaskets, 8 point locking systems and fast turnaround times make them highly appealing. Our Warmcore folding doors are the latest innovation. The great thing about Warmcore is its high thermal insulation and you also get a choice of profiles to choose from that many folding doors don’t offer. Schuco doors are for those that want a very slim door that can be made larger, taller and wider than the others. So we offer choice as every door is different yet all are some of the best you can buy and of great quality in design and manufacture. Can I buy off the shelf bifolding doors from you? We know there are some companies that sell bifolding doors at standard sizes. At Basfords all our doors are made to order to your precise specification, colour choice and handle options. Many off the shelf products are designed for mass production, for house builders looking to buy volume doors at low prices. Often these doors are mis-measures or surplus to requirements. 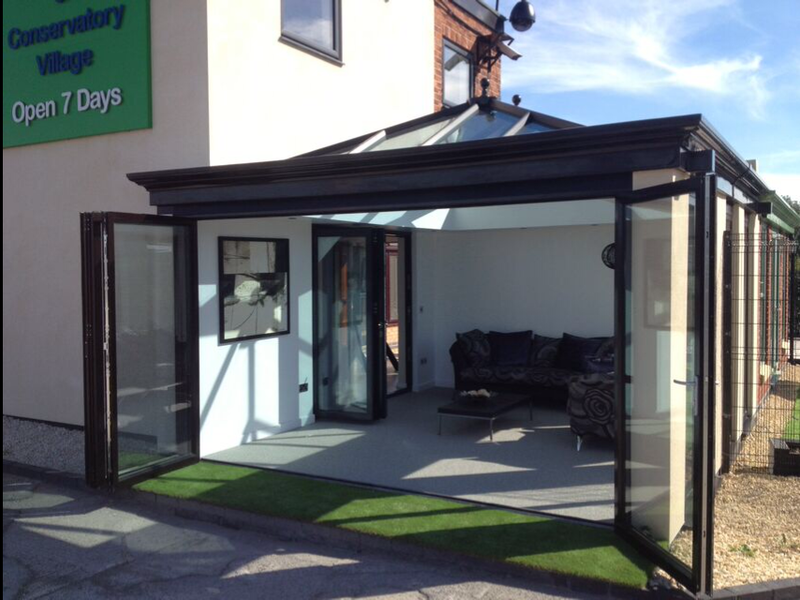 Our doors are built to suit your existing property or your new extension and not the other way round. Our Origin doors are available on lead times as quick as 24-48 hours. Therefore if you do need a bifold supplied urgently for your builder to fit, there is no need to buy an off the shelf door – you can still have a bespoke one! Yes. Bifolding doors benefit from all the latest locking innovations found in conventional doors. Our Origin doors for example feature an 8 point locking system that is quite superb. Our Schuco doors also meet the European standards for Burglar resistance. So whilst there can be a great many panels in a bifold door, they are remarkably secure. Should I buy bifolding doors online? As with any product, there are always cheaper online alternatives. Our advice is that you always view a bifolding door before you buy. Only by seeing a full size door, trying it out and asking questions can you really understand what these products are all about. It’s important to understand what an access leaf is, whether you like the look of the door aesthetically, what integral or other blinds will look like. Whether the door opens in or out and in which direction it folds is also vital. You may think you want an inward opening door, but often by seeing an actual door you realise an outward opening would be better. But by far the biggest reason to view a bifold is to have confidence in your bifolding door provider. Which way can folding doors open and fold? A bifolding door can open either in or out. In addition, there are several ways doors can be configured. You can have doors all sliding in one direction. With larger doors such as a 7 panel, you can have some doors folding one way and the remainder to the opposite direction. Bifolding doors can also be specified with an access leaf. This is quite an important feature that allows you to gain entry and exit from your doors without having to slide all the leaves back fully or partially every time. You can even have doors that are part of a corner arrangement as well. Is planning permission required for installing folding doors? Conservation areas or listed buildings may have constraints applied. Building Regulations must always be adhered to as well. Contact us and we can help you further. Who will install my new bifolding doors? It’s important to know that a new bifolding door has to be precision installed. With so many leaves and such wide structural openings, installation is critical. Basfords installers are specially trained in all aspects of fitting bifolding doors of all types and sizes. They are expert installers. What are the sizes possible with bifolding doors? Folding doors are available from two panels right up to 7 or 8. It is possible to have each door panel made as narrow as 400mm or up to approximately 1200mm. Door heights vary depending on the product. Schuco doors can go up to 3 metres in height and our Origin doors up to 2700mm depending on the door size generally and other factors. Contact us and we can advise you further. You’ll find that a combination of width and height affects how large or small a folding door can be made. Also, the wider the door panel the more space it will take up when folded back. What colour choices are available on bifolding doors? Aluminium bifolds are great not just because of slim lines with strength but also the huge colour choice available. All our thermally insulated aluminium bifolds are Polyester Powder Coated. This is a very intricate finishing process that has been used on aluminium doors and windows the world over for over forty years. All our doors are powder coated by established, certified and approved applicators. They carry the Qualicoat certificate which is the most stringent for colour applicators. Polyester powder coating gives you a choice of 200 colours. This colour choice is made even greater when many colours are available in a choice of matt, satin or gloss finishes. You can even have difference colours inside and out. Add to the special metallic finishes, textured colours and our advanced wood effects and the choice is endless. Did you know for example there are 27 possible shades of grey? The other great advantage of powder coating is that it can be enhanced to cater for doors in extreme environments. Examples include coastal locations, near swimming pools or in city centres. Can windows and other doors match my bifolds? Our bifolding doors are designed and made to work alongside windows and other doors. So you can have a complete home solution with aluminium windows, sliding doors, bifolding doors and entrance doors. What type of glass comes with my bifolding doors? We source our glass from world’s leading glass manufacturers such as Pilkington. All your bifolding door glass the highest quality and precision made. Our glass is toughened safety glass with 28mm sealed units. Added to this are special coating for energy efficiency, Argon gas and warm edge spacer bars. We offer a choice of glass upgrades including triple glazing, integral glass blinds and laminated glass.